Green Danger (7328-4) is one of the tougher late issue sets to put together. The green pants and camouflage top are made of a thin, cheap polyester, and the cammo is a brighter shade than other GI Joe sets. Accessories include a pair of low detail short black boots, a machete, a swivel top black storage crate (borrowed from the Demolition/Dangerous Removal set) and a sought after green snake. 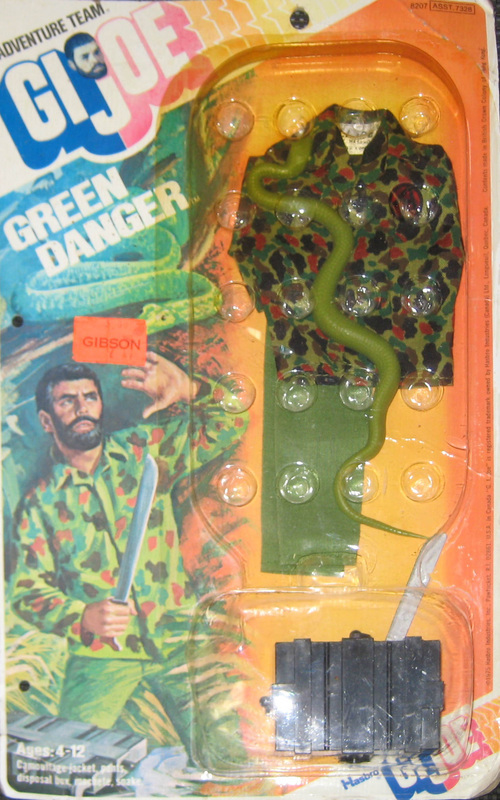 The mold is the same one used for the Mike Power Fangs of the Cobra set, but the Green Danger snake is a lighter color. The darker snake was also used in some overseas safari sets and is easier to find, so be careful that it hasn't been substituted. Below, the rare carded set, courtesy of collector Steve Stovall. See his eBay auctions here! Below, a comparison of the snakes from Fangs of the Cobra (top) and Green Danger (bottom). Note the Green Danger Snake is missing its tongue and tip of the tail.